Governor Rick Scott’s “KEEP FLORIDA WORKING” budget increases K-12 funding to a historic level of $19.75 billion, an increase of $261 per student over last year and $50 per student over the previous record in 2007-2008. In addition, the Governor’s budget also includes $20 million to create a Rapid Response Start-up Grant program for technical centers, $5 million to incentivize $10,000 STEM degrees at Florida Colleges, $80 million for Digital Classroom plans, and $23.5 million to expand Bright Futures to cover summer term courses. The elimination of sales tax on college textbooks. To learn more about the “KEEP FLORIDA WORKING” budget, visit www.keepfloridaworking.com. The arts are often the first opportunity a student has to apply, practice and enhance the skills they are learning in core academic subject areas. As an elementary school arts educator, I try to incorporate reading into my lessons and often ask my students to write about their art process. 2015 Florida Teacher of the Year Christie Bassett visits students with First Lady Ann Scott during Celebrate Literacy Week, Florida! Sometimes I use artist biographies to have my students read to shoulder partners. Or, I might read aloud about the technique we would be using. Occasionally, I would find a magazine article on the subject of our art project and have my student take turns reading to the class. My favorite types of books to share with my art students are ones illustrated by the book’s author. In addition to reading the book, I enjoy discussing with my students that many talented artists not only create the words on the pages, they also make the words come to life with their artwork! All of my students kept asking, “Will the new teacher READ to us?” Reading during art class has made so much of an impact on my students, possibly even more than I realized while I was teaching them. It is my hope that Florida students, parents and educators will set aside time to check out these fantastic creations with their students! As a parent of two little ones myself, I know that time is a precious commodity. However, reading with your students is a gift that keeps growing with every word and every page. About the author: Christie Bassett is an art teacher from Polk County, Florida. She is spending the 2014-2015 school year traveling the state of Florida speaking to educators, future teachers, district personnel and business leaders about the continued success of Florida’s public education. You can contact Christie at 2015FlaTeacheroftheYear@gmail.com and read her biography at http://www.fldoe.org/teaching/recognition-recruitment/fl-teacher-of-the-year-program/past-winners-finalists/2015.stml. I have loved reading for as long as I can remember. So, when I became First Lady, I knew I wanted to focus on literacy and share my passion for reading with Florida’s students. Rick and I were blessed with two daughters, Allison and Jordan, and while they were growing up we spent a lot of time as a family poring over books. Now, they are grown with families of their own and I have the pleasure of watching them show our grandsons, Auguste, Quinton and Sebastian, the joy of reading. 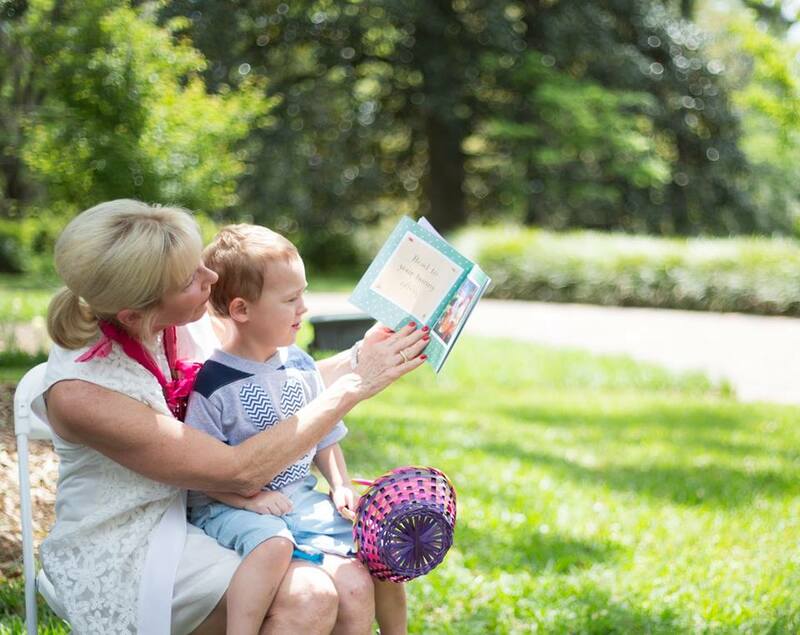 First Lady Ann Scott reads to her oldest grandson, Auguste, at the 2014 Florida Governor’s Mansion Easter Egg Hunt. I was the oldest daughter of four children and my family did not have many books growing up, so we relied on the school and local libraries, where we spent countless hours perusing the shelves. It was there, between the rows of bookshelves, that I developed an abiding love for reading that has stayed with me my entire life. In fact, some of my fondest childhood memories revolve around these trips to the library and the hours my siblings and I spent picking out as many books as we could carry home. In elementary school, I read all of the biographies in the school library. Then, as a pre-teen, I was introduced to classic literature from both Charlotte and Emily Bronte, including my favorite novel, Jane Eyre. Who would have known that reading 19th century gothic literature in the back of the library would introduce me to the other love of my life, my husband, Rick. The very first time I met Rick was at our high school library in Kansas City, Missouri. 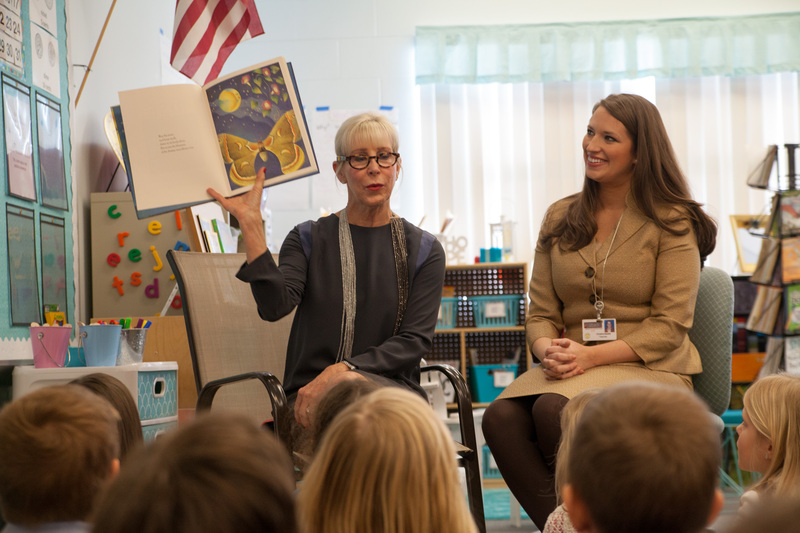 As Florida’s First Lady, I have had the opportunity to visit elementary, middle, and high schools from the Panhandle to the Keys to talk with students about making reading a part of their daily routine. Next week, January 26-30, we will begin the 2015 Celebrate Literacy Week, Florida!, with events and school visits across the state. This is my fifth consecutive year participating in the annual event, which I believe is a wonderful reminder to students, parents and teachers that reading is absolutely fundamental to success both inside and outside the classroom. I am encouraging all Floridians to join me in making literacy a priority in our homes and workplaces. You can visit Celebrate Literacy Week, Florida! for more information, including a list of exciting statewide events and initiatives. Show how you are promoting literacy in your community by using the hashtag #CLW2015. About the author: First Lady Ann Scott is a devoted wife, mother, and grandmother. High school sweethearts, the Governor and First Lady have been married for 42 years and have two married daughters, Allison and Jordan, and three adorable grandsons, Auguste, Quinton, and Sebastian. An avid reader, the First Lady loves traveling the state, sharing her passion for reading and literacy with Florida’s students. Honoring outstanding educators and students is by far my favorite activity as Florida’s Commissioner of Education. The only thing that makes the recognition even better is when it is a total surprise. Last week, I visited Frances K. Sweet Elementary School to recognize fourth grade educator and Florida’s 2015 Milken Educator Award winner Nardi Routten. Only, Nardi had no idea she was receiving an award. What a joy to see her reaction to winning this prestigious award and how fervently her students cheered during the announcement. It was evident in that moment how much she has contributed to her students, colleagues and the school as a whole. Nardi was recognized for her strong track record of raising student achievement. In fact, her students regularly score higher on both district and state assessments, which is a direct reflection of the extra time she spends with individual students. Because of the great work of Nardi and others like her, Florida will continue to be a national leader in education. To learn more about Nardi’s accomplishments, visit the Florida Department of Education’s newsroom. During today’s Cabinet meeting, Governor Rick Scott recognized nine outstanding educators for their contributions to education with the Governor’s Shine Awards. In conjunction with 2015 Celebrate Literacy Week, Florida!, which is being recognized January 26 – 30, Governor Scott honored teachers who specialize in the fields of reading and English language arts. Each year, Celebrate Literacy Week, Florida! brings together education leaders and volunteers to promote the importance of literacy. This year’s theme, “Reading Accelerates Success,” connects the value of literacy with careers in science, technology, engineering and mathematics (STEM). Donna Born, Okaloosa County, Meigs Middle School– In Donna Born’s reading classroom at Meigs Middle School in Shalimar, FL, student-led interactive activities are all around. After 32 years of teaching in the Okaloosa County School District, the success of Born’s readers remains her top priority. Her creative approach to teaching readers has garnered her the title of Florida’s Middle School Reading Teacher of the Year. Believing each student has the potential to achieve success, Born’s hope is that her students gain confidence and realize the unlimited possibilities that are achievable. Paul Caswell, Orange County, Windy Ridge K-8 School – Paul Caswell, in his 24th year of teaching, is a first grade teacher at Windy Ridge K-8 School in Orlando. Caswell holds an English for Speakers of Other Languages (ESOL) endorsement. In addition to classroom duties, he has served as a technology coordinator, media specialist and an instructional support teacher working with testing, and exceptional student education services compliance. A recipient of the 2013 Florida Elementary Reading Teacher of the Year award, Caswell has taught colleagues various reading strategies including reading analysis and Literacy SMART Centers. John Fuller, Alachua County, MYcroSchool – John began as a fifth grade teacher and has since transitioned to teaching at MYcroSchool, a charter high school in Gainesville. Over the last four years, Fuller has been named Employee of the Year twice and has helped update the English curriculum. Fuller has also worked with the Florida Department of Education in training teachers on how to implement the new Florida Standards during the Summer Institutes of 2013 at various sites around the state. Pam Garrett, Leon County, Leon High School – With more than three decades of teaching experience in Florida under her belt, Pam Garrett says she knew she wanted to be a teacher since the second grade. Her love for reading and writing has inspired her students to think outside the box and find their own passions. In her classroom, she and her students strive to dig into a literary work to find the author’s true meaning and to examine his or her writing techniques. Garrett, who has taught English and journalism, is a National Board Certified teacher and a former Teacher of the Year. Paul Holimon, Collier County, Oakridge Middle School – Paul Holimon has taught high school English, writing, creative writing, Latin, intensive reading, AP language & composition and advanced communications methodology for a decade. After four years supporting teachers and shaping policy as a district coordinator of secondary literacy and president of the Council of Language Arts Supervisors, he has returned to the classroom at Oak Ridge Middle School, where he is passionately encouraging his students to use curiosity as a catalyst to explore the world from new perspectives. Erica McDowell, Hernando County, District Reading Coach– Erica McDowell serves as literacy coach for the Hernando County School District and has been impacting student learning for more than 18 years in the district. McDowell has always had a passion for reading and works to help all students gain a love of reading and to be life-long learners. McDowell’s goal as a literacy coach is to maximize student learning and help students reach their full academic potential. McDowell believes that education goes beyond the school walls and that education is most enhanced when businesses, families and community members participate in the process. Anjanette McGregor, Lake County, Tavares High School – Anjanette McGregor entered the teaching profession 11 years ago. She began her teaching career in Monroe County and then relocated to Lake County where she teaches high school intensive reading and English language arts. She works diligently to keep all teachers abreast on the new standards, including innovative ways to implement those standards to increase student engagement and success. McGregor is currently working on a community education project that will focus on the intricacies of education policy with the goal of increasing parental and community involvement. Sandra Misciasci, Hillsborough County, Newsome High School – An 11-year veteran of Hillsborough County Schools, Sandra Misciasci teaches Intensive Reading at Newsome High School in Lithia, FL. Misciasci is a passionate teacher who works tirelessly to reach all of her students. Misciasci was recognized as 2013-2014 State of Florida Reading Teacher of the Year, and has served as district trainer for Hillsborough County. Natasha Murphy, Marion County, West Port High– Natasha Murphy has been a Marion County teacher for 12 years. She is currently teaching 10th grade remedial reading at West Port High School in Ocala, Fla. Her greatest joy as a teacher is turning reluctant readers into passionate learners. She seeks to unlock her students’ ultimate literacy potential. She gets her students excited about reading and is committed to turning hesitant readers into lovers of literacy. Each February, our staff reads more than 1,200 student essays submitted to Florida’s Black History Month essay contest. It’s a challenge that our entire office looks forward to, in large part, because of the passion, insight and creativity weaved through every submission. Last year’s best essays shared numerous true stories of incredible heroism and sincere hopes for the future. Our 2014 high school essay winner, Javan Latson, shared the powerful story of his grandfather Leonard, a law enforcement officer, who challenged a policy barring black officers from driving police cruisers. You can see why I am so eager to dive into the essays we will begin receiving during the next few weeks. I hope you will share this important contest with the students in your life and encourage them to participate. Students, parents, teachers and principals are invited to nominate full-time, African-American educators in elementary, middle and high schools for the Black History Month Excellence in Education Award. All entry forms and guidelines for the contests can be found at www.FloridaBlackHistory.com. Art and essay contests are open to students in Kindergarten to 12th grade. The theme for this year’s essay and art contests is “A Celebration of African-American Innovation and Innovators.” Students are asked to share how African-American innovators have shaped Florida. The art contest is open to all Florida students in grades K-3, and two winners will be selected. The essay contest is open to all Florida students in grades 4 through 12. Three winners will be selected: one elementary student (grades 4-5), one middle-school student (grades 6-8) and one high school student (grades 9-12). Winners will receive a four-year Florida College Plan scholarship provided by the Florida Prepaid College Foundation. Information about the contests and Florida’s Black History Month is available on Florida’s Black History Month website at www.FloridaBlackHistory.com. Right before the beginning of the school year, I had a chance to meet with a small group of teachers gathered at Kate Sullivan Elementary School in Tallahassee for a workshop on effective classroom instruction. After an engaging conversation with the participants, I noticed an intriguing question written on the facilitator’s flip chart: “What are the learning goals of the unit?” The question was the first step in encouraging attendees to start thinking about what they wanted their students to achieve and then working backwards to determine what objectives would accomplish their goals. We recently applied this concept at the department in anticipation of Florida’s 2015 Celebrate Literacy Week – January 26 – 30. During this special week, thousands of schools from across the state participate in activities that promote and encourage daily reading. I shared with our team that one of my goals for this annual celebration is to set a great example for Florida’s schools, districts and other state agencies by participating in literacy-building activities throughout the month of January. To accomplish our goal, we’ve came up with a few fun activities any organization can implement to cultivate literacy skills both inside the classroom and the workplace. F avorite Book Door Posters – This a great way to demonstrate your passion for reading while also sharing book suggestions with your colleagues. You may be surprised to find which of your co-workers enjoy the same books as you. You can download a copy of the poster we created here. Book Drive –We encouraged department staff to bring in new and gently used young adult/children’s books to donation boxes located throughout our building. Reading Challenge – One of the key events of each Celebrate Literacy Week is the Million Minute Marathon, where more than 1.2 million students take time out of their day to read. To mirror the marathon’s success, we are hosting our own reading competition, where each employee will log the number of pages they read each week. Regardless of your job, literacy is critical to lifelong success, and I believe that children and adults need to make reading a part of their everyday routine. Let us know how your families, classrooms and offices are making literacy a priority by emailing us at CommunicationsOffice@fldoe.org. You can also add your voice to our literacy conversation, by using the 2015 Celebrate Literacy Week, Florida! hashtag #CLW2015.